Reliance JioFiber Could Launch In March - Everything You Need To Know! Jio is ready to launch its fixed-line broadband services named JioFiber which will offer high-speed data at extremely affordable prices. The broadband offering from Reliance Jio has been in the news for over a year now. Finally, the Mukesh Ambani-led company is all set to foray into the broadband business. The company has already revolutionized the Indian telecom industry and now is all ready to launch its own low-cost internet services with JioFiber. Jio disrupted the equilibrium of the telecom market by offering free 4G services for a staggering period of six months and later went on to launch aggressively priced plans which forced its competitors to drop their prices as well. With JioFiber, we can expect a similar disruption in the Indian broadband space. JioFiber will make way for high-speed broadband internet services in the country which will carry data speeds as high as 1GBPS at extremely affordable prices. The launch date is not yet finalised, but as per the early reports, JioFiber is expected to go live by early March or by the end of this financial year. JioFiber is currently in the testing phase in as many as 10 cities across the country for over six months now. Jio is providing its broadband services in select regions like Surat, Mumbai, Ahmedabad, Vadodara, Delhi NCR, Hyderabad and Jamnagar. In the first phase, JioFiber will roll out in Ahmedabad, Delhi, Hyderabad, Jaipur, Kolkata, Mumbai, Surat, Vadodara and Visakhapatnam. The JioFiber Preview offer will provide 100GB of free high-speed data per month for the first three months. Initially, Jio has promised three months of free broadband services. But that might change in the future, and users might get free services until Jio officially launches its fixed broadband services across India. As far as pricing is concerned, after the free offer period ends, subscribers might have to pay Rs. 500 per month for 600GB and Rs. 2000 per month for 1000GB data at speeds of up to 100MBPS. This is according to the plans which were leaked earlier. The plans will definitely change after the commercial launch of services. The fixed broadband prices are usually much lower than telecom mobile data or wireless data, a trend which has prevailed in the country before the mobile data rates came down drastically. With the launch of Jio’s broadband services, the rates are expected to go further down. JioFiber will lead to a revolution in the Indian broadband sector like what Jio did with the Indian telecom sector. The affordable JioFiber plans with high-speed data offerings will definitely affect mobile data prices directly in the future. The other service providers in the broadband space, Airtel Broadband, ACT Fiber, BSNL and MTNL have already dropped their prices and are offering more data at higher speed caps. In fact, the local internet service providers are offering more data at reasonable rates. Broadband companies are also offering long-term half yearly plans or even annual plans in an effort to lock-in more subscribers. In the end, all this competition will mean more benefits for the subscribers. Reliance Jio is planning to offer broadband, Internet TV and DTH connection via its own single fibre connection to promote its additional Jio services. The Jio network will cover a number of services that you don’t need to pay for; like your landline, broadband and cable TV connection, separately. Users will get a fixed voice, media share, live and catch up TV, home automation, surveillance and other services bundled together with Jio’s entire content base. The offer is sounding sweeter by the minute. Now its just a matter of time before JioFiber is rolled out commercially and available across India. "Reliance JioFiber Could Launch In March - Everything You Need To Know! ", 4 out of 5 based on 6 ratings. 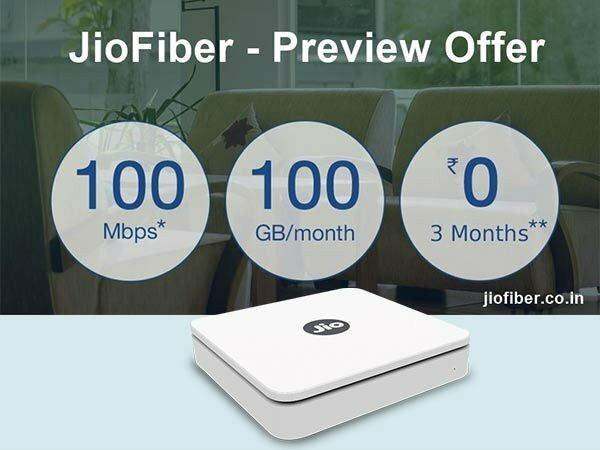 JioFiber Starts Rolling Out Free 1.1 TB With 100 Mbps Speed In Select Locations! The greatest thing to happen to India since independence. This is the beginning of a new era of Indian *civilisation*.